How do you treat your chipboard? Hi everyone, Jennifer here. 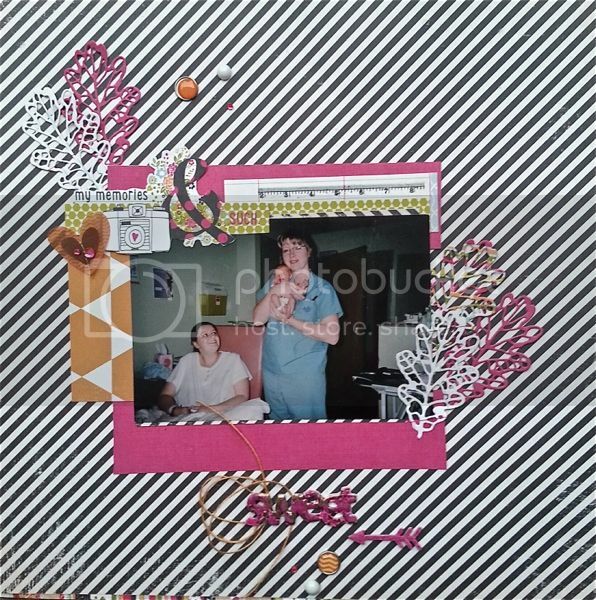 I wanted to share a layout with you before I show you the chipboard technique that I used this week. These little ladies are my nieces Cassie and Lauren. 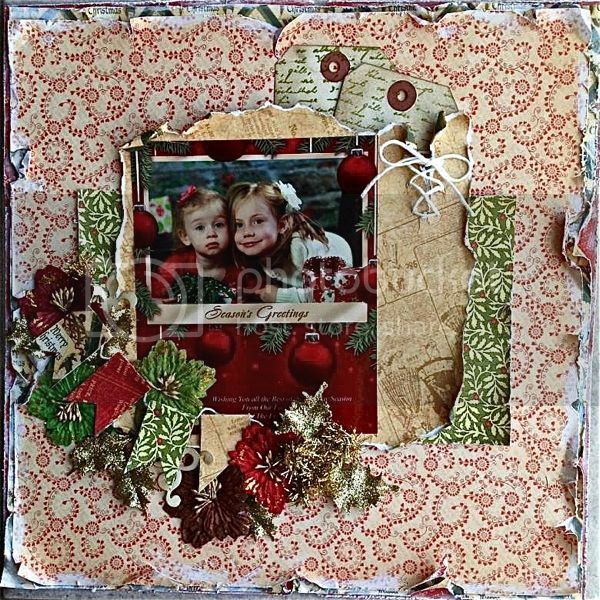 I thought their Christmas card was too cute not to be featured in a layout. There are lots and lots of layers on this page. I dulled down the paper by adding a some pumice stone distress ink to all the papers. The top paper had some picket fence distress ink added as well. I think my favourite part of this layout is the flower cluster with the banner. I created the banner out of scrap coordinating paper. It is so easy to make and has a nice visual impact. My second layout is me at work. For those of you that don’t know, I am a labour and delivery nurse. I decided to use a photo that shows one of the best parts of my job…. cuddling babies although this baby doesn’t seem so impressed with the whole process. I covered the Maya Road chipboard word in picked raspberry distress paint. while it was still wet I sprinkled on some Stampendous chunky metallic seasonings embossing enamel. I love this stuff. It really does look like metal. I added a few layers of the embossing enamel in various places and at the end I dabbed a little more picked raspberry distress paint on. The colour combinations could be changed up and many different looks could be achieved with this product. The arrow is cork and it was covered with some paint too.